Our unit is having a complete face lift coming late April. Save by booking with us - Your ticket to a vacation in paradise starts at Gulf Shores Surf and Racquet Club. We offer the best of 2 worlds - right between the Gulf of Mexico and the Little Lagoon - located on the quiet West end of Gulf Shores. GSSR is directly on the Little Lagoon, from our balcony you have a magnificent view of the Little Lagoon, our beautifully landscaped court yard and pool area. When you open the front door, you can see and hear the ocean. One of the best views of the Little Lagoon in the complex! Imagine waking up in the morning, walking out onto your private balcony, while having breakfast, you hear the water softly trickling down the rock waterfall, you look out over the lagoon and catch a glimpse of a fish as it jumps, paradise! This is an ideal complex for families; it offers something for just about everyone. The complex has a boat ramp on the Little Lagoon for boaters or wave runners, or you can fish or crab from our 2 lighted private piers. Come take a look and visit us in paradise. Don't be fooled by low prices....make sure you know what you are getting. I can't explain the time my family and I had, I believe it's the best vacation ever! For you piece of mind we have been in business for 9 years and maintain our business license with the City of Gulf Shores. We are listed on the Alabama Gulf Coast Convention & Visitors web site. 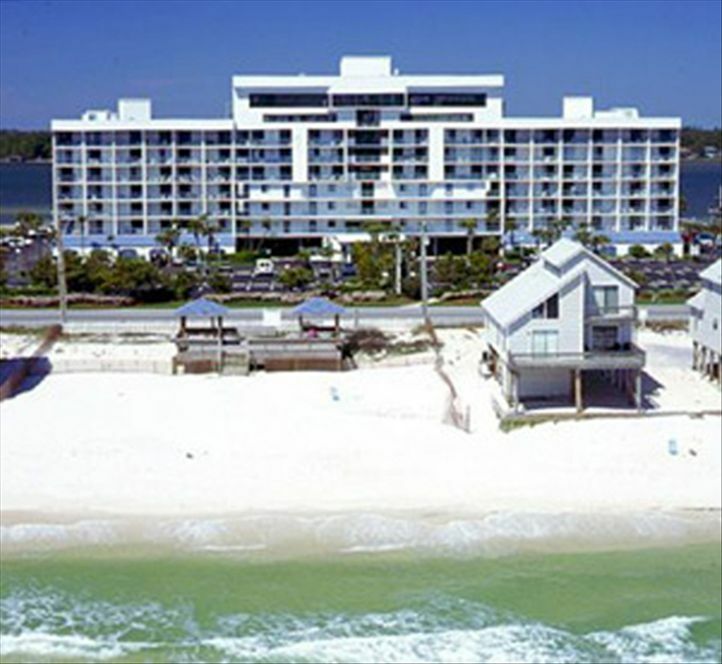 We strive to maintain our condos to the highest level - to do our part to provide you with a nice place so you have an enjoyable visit to Gulf Shores. Please check out our reviews...... Hope to see you soon...see us at Gulf Shores Surf and Racquet Club. Only methods of payment we request are checks, Paypal or credit card - We do not request money to be wire transferred. If you receive a request to wire transfer money it is not from me. We offer the best of both worlds Located on the Little Lagoon and just across the street with private beach. Tennis anyone? We have 2 lighted tennis courts, a shuffleboard court. The children's pool and adult hot tub are located within a few feet of the swimming pool - so you can keep an eye on junior while enjoying the pool. Dolphin Tours, GSSR has a open shower conveniently located - to wash sand off you and your beach supplies as you return from the beach. Full Kitchen: Toaster, coffee maker, crock pot, pots pans, knifes - forks just about anything you will need for your vacation. Charcoal BBQ Grill: 4- charcoal grills and picnic tables down by the lagoon and tennis court area. Gazebo: One gazebo in our pool area and a double gazebo located on our private beach property. Minimum Age Limit for Renters: Minimum rental age 25. New Addition - we just added high speed internet in our unit. Our 750 sq. ft. 2 bedroom, 2 bath condo is located on the Little Lagoon and has our own private beach just across the road. The beach is just a short distance across a quiet 2 lane street. If you are looking for shopping - in the Gulf Shores/Orange Beach area you can shop until you drop... outlets and specialty shops all along Hwy 59 - we are approximately 3 miles from Hwy 59.